Dozens of types of inferior arms were in use by the Italians, ranging from old model Vetterli rifles which were among the first ever developed to handle metal cartridge cases, to atrocious Bodego revolvers in which the empty cartridge cases have to be dug out with a knife. 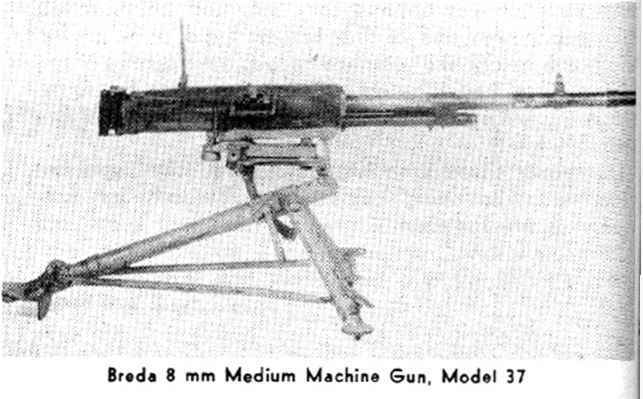 The 8mm Breda medium machine gun model 37 is a reasonably good, though heavy, gas operated, air-cooled gun. Cocking handle is on the right side, and traversing handles and thumb triggers are provided as in the Revelli gun. This weapon was not issued in large enough quantities to warrant an extended description. 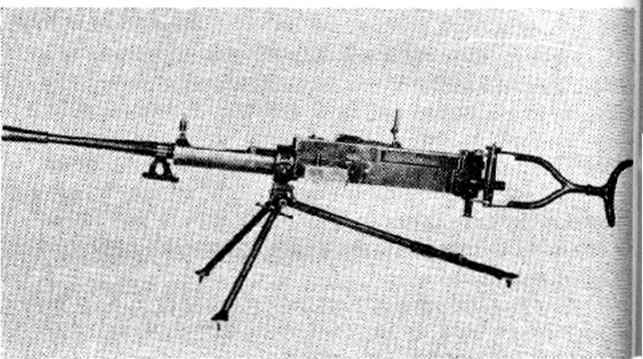 Yet another Italian type, taking an 8mm cartridge which is not interchangeable with the 8mm Breda, and hence added to the Intolerable supply problem of the inefficient Italian Ordnance Deoartment, Is the Fiat (or Safat as it is sometimes called) light machine gun. This too is a gas operated, air-cooled weapon. While the design is not bad, it is woefully inefficient when compared with accepted military standards. Italian equipment may best be summed up in words variously ascribed to U. S., British and even German ordnance men. It runs like this: "Some factories In Italy have been manufacturing firearms since the 16th century. They must be fine weapons; because all of them were in use by Mussolini's army!" Caliber: 8mm. This is a specially designed cartridge, its general appearance being bo~tle-necked and patterned after the Luger .30 cartridge. Its diameter however "s larger than the Luger .30 which is 7.65 mm. Magazine: Box type single line, capacity 7 cartridges. Muzzle Velocity: About 860 feet per second. Weight of Bullet: 102 grains, special hard lead bu let. without jacket. Also stce jackctcd. Muzzle Striking Energy: About 230 pounds. 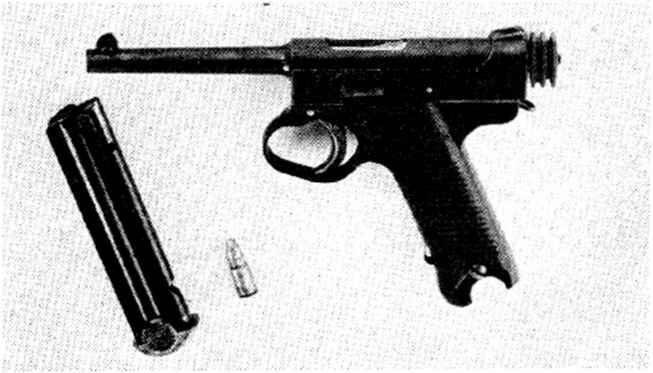 Overall Length of Pistol: About 9". Sights: Front sight fixed. Rear sight has s.iding ¡eaf and is adjustable *or elevation. Maximum Range: About 1400 yards. 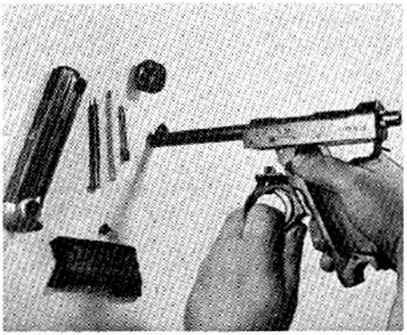 Locked: By locking bo.t swinging up through barrel extension into underside of breech lock as in the Glisenti and Mauser type pistols. Type of Fire: Single shot only. Position of Bolt When Last Shot is Fired: Open. When magazire is extracted or loaded magazine inserted pulling back on bolt head slightly will free tne bolt and permit it to run forward. Safeties: (a) Automatic grip safety directly under trigger guarO. As in Cot and Glisenti pistols, when pistol is gripoed f'rmly, safety g^'p moves in, permitting pistol to be f red. (b) Automatic disconnector prevents pistol from ocing fired until bolt moves forward and breech is completely locked. Note: This pistol comes in a very heavy leather or wooden holster stock, which can be attached to the slot in the hand e of the pis*ol to form a carbine. Unlike tne Mauser pistol, this holster is not long enough to make a satisfactory shoulder stock. Instead it is orovided with a telescopic extension which may be pulied out to lengthen the shoulder stock. This oevice is of questionable value in actual comoat use. as the sighting arrangements for firing with extended hand as in pistol operation, or from a shoulder stock in caroine fashion are entirely different. 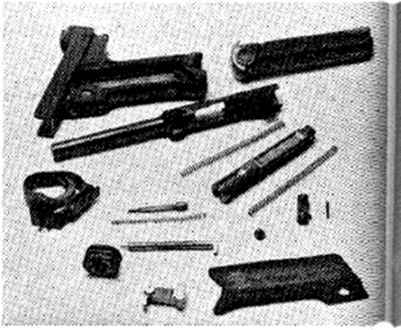 This is a production model differing in many essentials Irom THE ORIGINAL MODEL of the Nambu pistol. It has no grip safety but is provided with a thumb lafety directly aoove the trigger on the barrel extension •x sleeve. Swinging this around in an arc sets the pistol at safe. Sights or. this model are fixed. Cocking picce •x bolt differs from that of the earlier model in being areolar. The recoiling parts are rather differently set b. 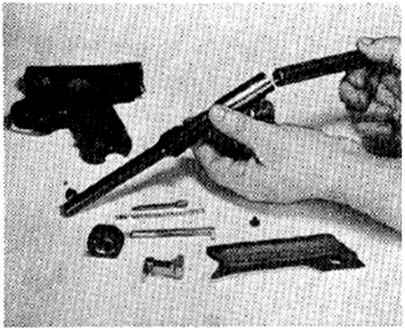 Trigger guard is of a peculiar e ongated shape in-■ended to permit the pistol to be used with a heavily ved finger. This is a typicahy Japanese characteristic nd in many weapons produced in Japan. 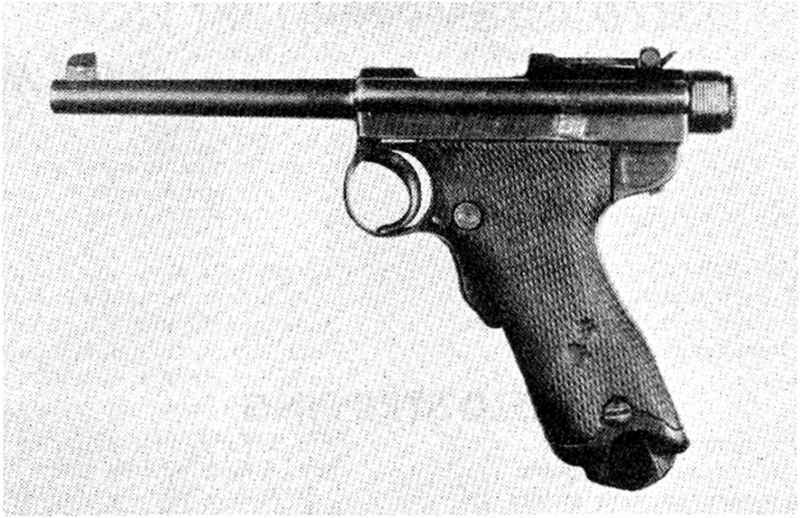 While the fip is patterned after the Luger pistol, the action is patterned more after the Glisenti pistol.